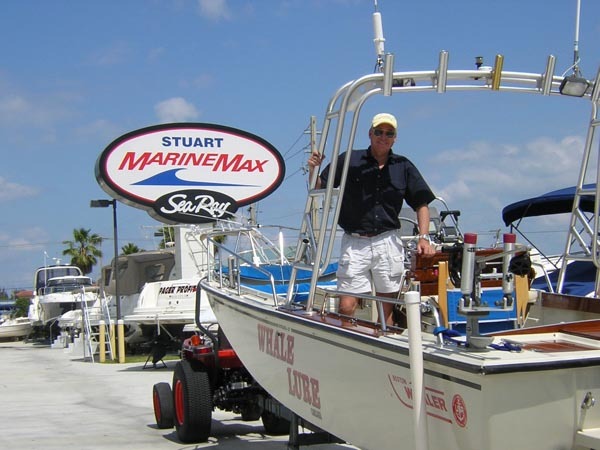 The Boston Whaler Owners Event was hosted by Marine Max of Stuart, Florida. Located on the east shore of the St. Lucie River, their beautiful 2-year old facility was a great spot for the event, and they were very gracious and accommodating hosts. Because of the rather steep launching ramp, LHG opted to use their yard tractor to launch WHALE LURE. A TEMPTATION 25 Whaler Drive, an OUTRAGE 25, and an OUTRAGE 25 CUDDY moor at the docks in front of Marine Max. 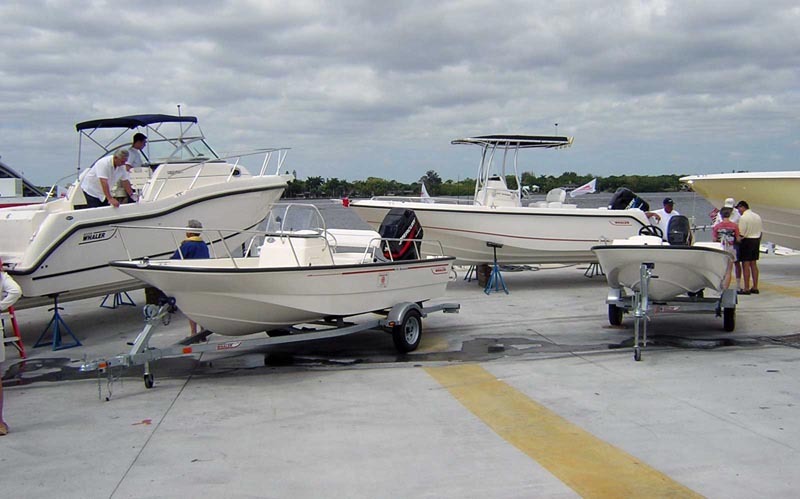 On the hard behind them is Boston Whaler's newest offshore center console, the 320 OUTRAGE. Ace (whalerAce) and Nick (bigshot) cruised with us for a Friday afternoon boat ride on the St. Lucie River. We explored upstream about five miles until we encountered a lock. The entrance channel to Marine Max is marked with unambigious indications of where the deep water is located. By Friday evening a good crowd had arrived. 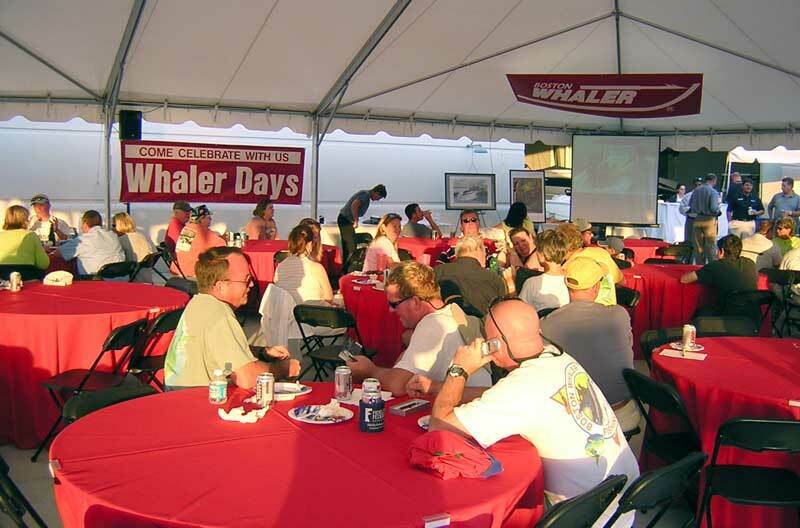 The Boston Whaler factory served up some excellent food, an open bar, and door prizes galore. The balmy evening gave everyone a chance to meet and yack non-stop about Boston Whaler boats. Here we are just waiting for the sun to set so we can see the slide projector and get the low-down on the fishing tournament rules. The party went on until dark on Friday. 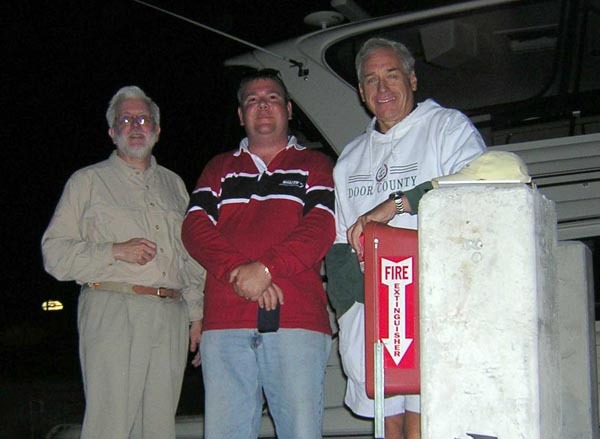 Here Nick, Larry, and I are on the pier overlooking some of the factory boats in the water. 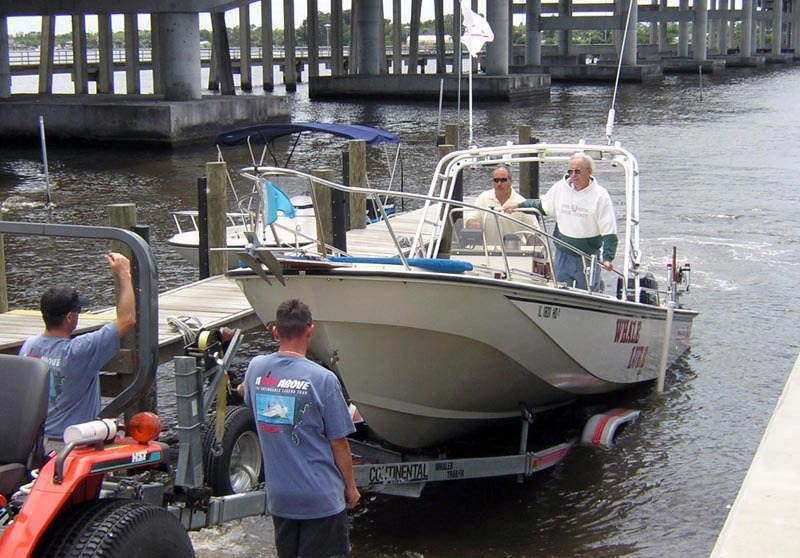 In addition to the 320 Outrage in the water and available for demonstration rides, another example of this fine new Boston Whaler was on the hard for inspection. The underwater shape of this vee-hull has this interesting flat pad on its bottom. 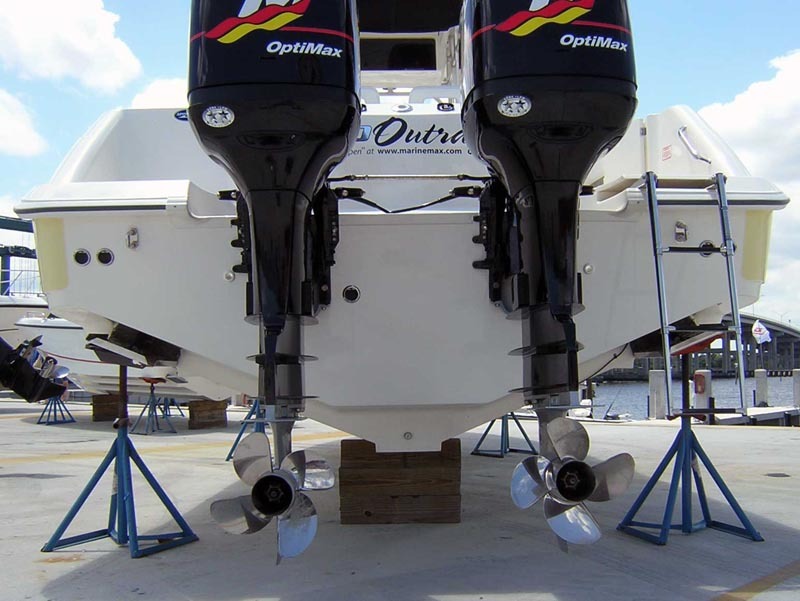 This boat is powered by 250-HP Optimax Race engines. Note that the hydraulic steering uses dual cylinders to handle these powerful motors. Four-blade Mercury Revolution propellers convert torque to thrust. We took a revealing test ride on the Boston Whaler 240 OUTRAGE. 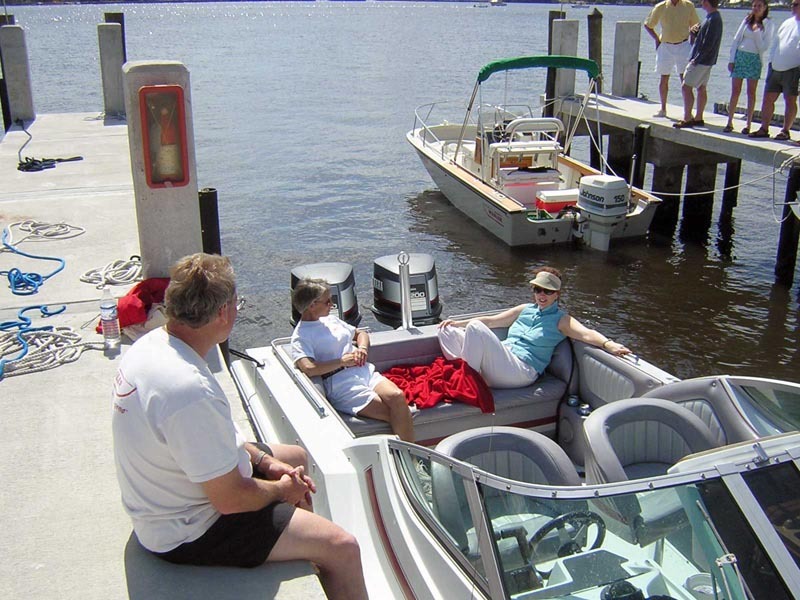 Powered by twin Mercury Optimax 150-HP engines, these 2.5-liter V-6 motors pushed the boat to over 51-MPH. 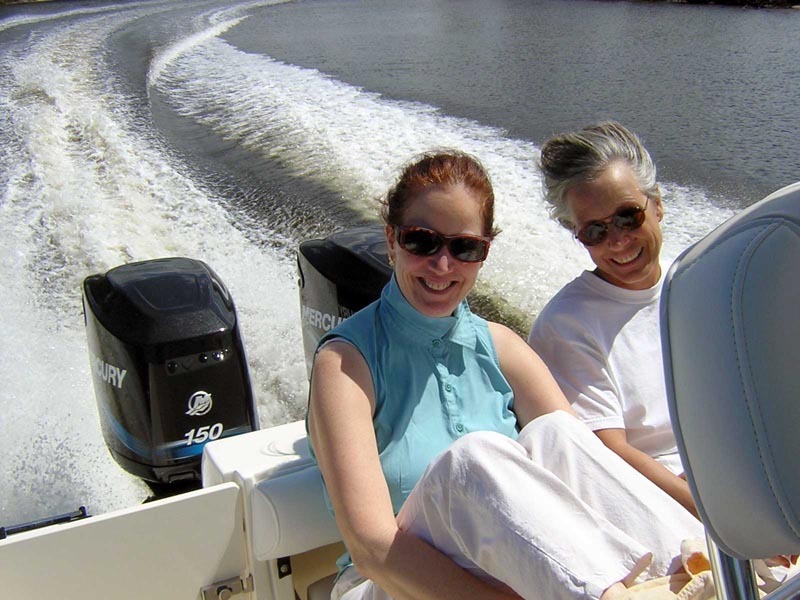 Chris and Susan enjoyed the stern seat, and said the engine noise was very quiet, even at full throttle. This was our first chance to experience the Optimax engine underway. The boat had excellent throttle response, and handled beautifully. Here we are running about 30-MPH. Note the compact and rather small wake the boat is leaving behind. Robert Moore from Mercury was our guide on this run. If Mercury could clone Robert and put him in every dealership, they'd own one-hundred percent of the outboard market! 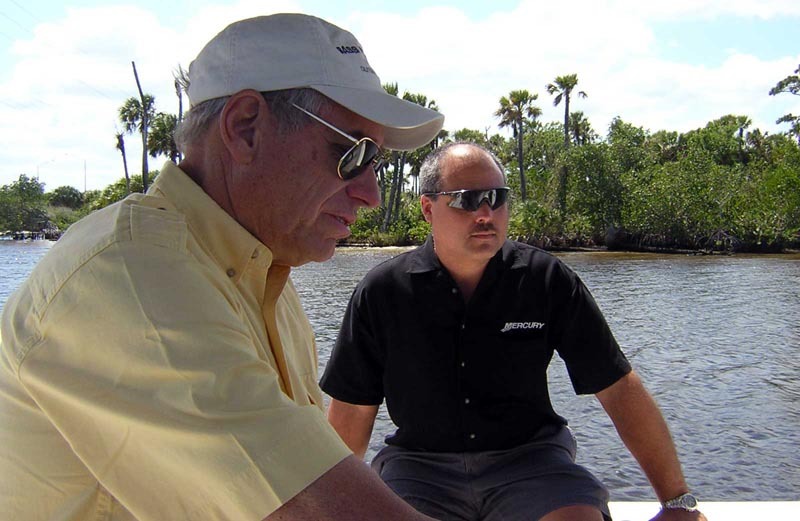 He was an amazing source of knowledge of outboard motors and an encyclopedia of the Mercury product line. If I wrote down everything I learned from talking to Robert over the weekend, it would fill a book. What a great guy! After this test ride we came back with new-engine fever. The 240 Outrage helm had the SmartCraft gauge option installed. In this twin engine set up there is a central Speedometer gauge flanked by twin Tachometers. The gauges also have a digital LCD display on the lower portion that provides about thirty additional functions. One very handy feature was the digital trim gauges. Whenever you hit a trim button, the digital display immediately jumps to show the engine trim position. This makes it very easy to match up the engine positions or to set them to a desired trim. The engine's computers also provide realtime fuel consumption numbers. We were able to cruise at about 28-30 MPH with fuel economy of 3.1 Miles-per-gallon (total for both engines). That was an impressive display of the fuel saving that comes with the Optimax 2-stroke. LHG's boat, with twin 200-HP EFI that have the same 2.5-liter block, generally cruises at about 2-miles-per-gallon at these same speeds. The Optimax engines were giving a boost of about 40-50 percent in fuel economy at this duty. 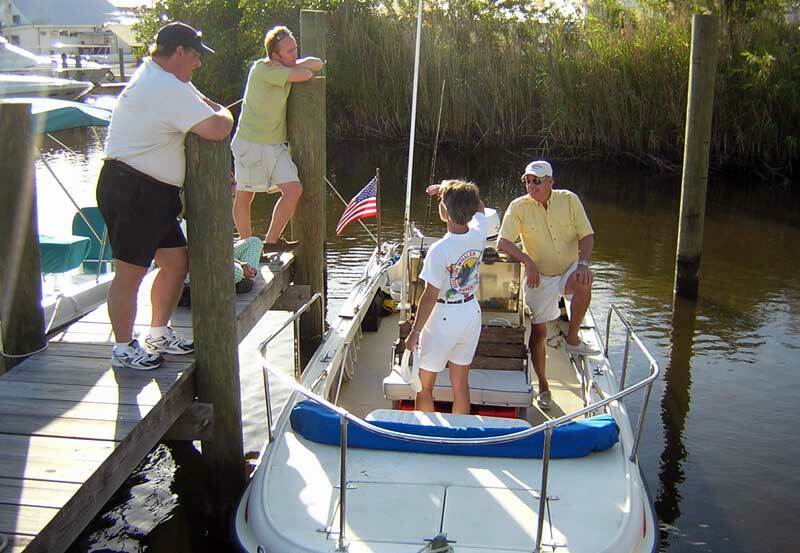 While Ace looks on, Chris and Susan check out the comfortable seating in the stern of his 25 Temptation. At the other dock is the nicely restored OUTRAGE 18 that belongs to George Nagy. As you can see, these classic Whalers also drew some dockside admirers. LHG and Susan check out the cockpit of Al's (Al_A_Buy) Outrage 21, while George Nagy consults. This is the Monterey Inn motel marina around the corner and a short walk under the bridge from Marine Max. A number of fellow classic owners stayed here for the weekend. In addition to the in-water boats, there was quite a bit of product on land to show. The 190 Nantucket, the 320 Outrage, the 150 Sport, and the 130 Sport were on display. A 210 Outrage, a 170 Montauk, and a 255 Conquest rounded out the shore display boats. People were climbing on them all weekend. Wil Rogers of the Boston Whaler factory took us for a very impressive ride on the 305 CONQUEST, their newest and largest cabin boat. Note the (wide open) position of the throttles on the Digital Throttle and Shift (DTS) controls. 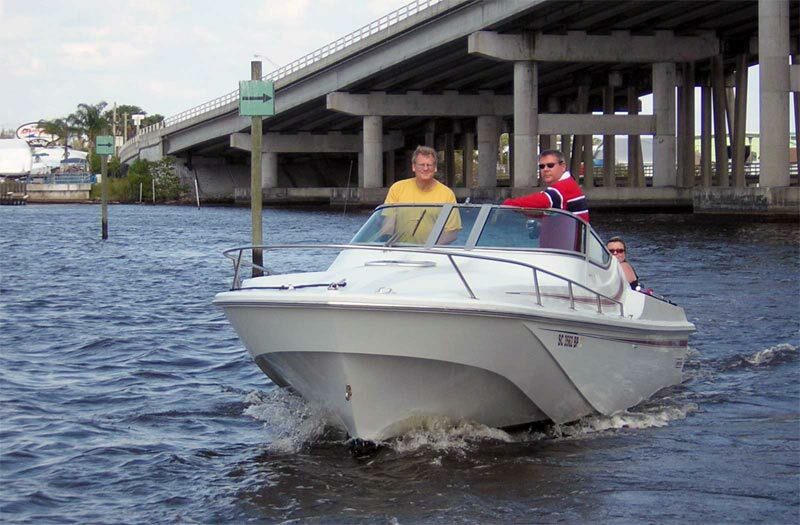 The twin 250-HP VERADO engines had us cruising along close to 40-MPH. I think Will is about to warn us, "I am going to make a series of sharp turns." He would then launch into a series of figure-eight turns that would be hard for a 13-footer to follow. Yet the big boat felt more like a "vessel" than a Whaler. If only you could trailer this monster! Also note a very interesting feature in the hard top: there are built-in zippered storage tubes into which the side curtains and other canvas can be rolled up. 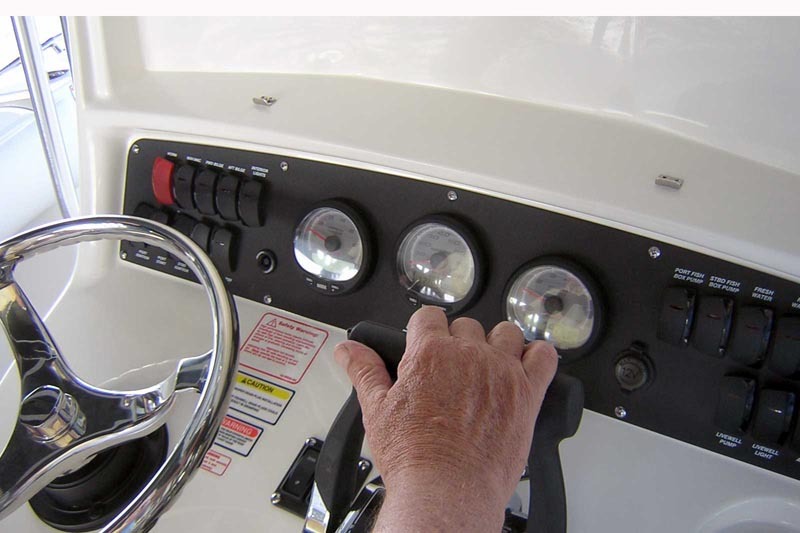 Details like this draw buyers to a Boston Whaler. 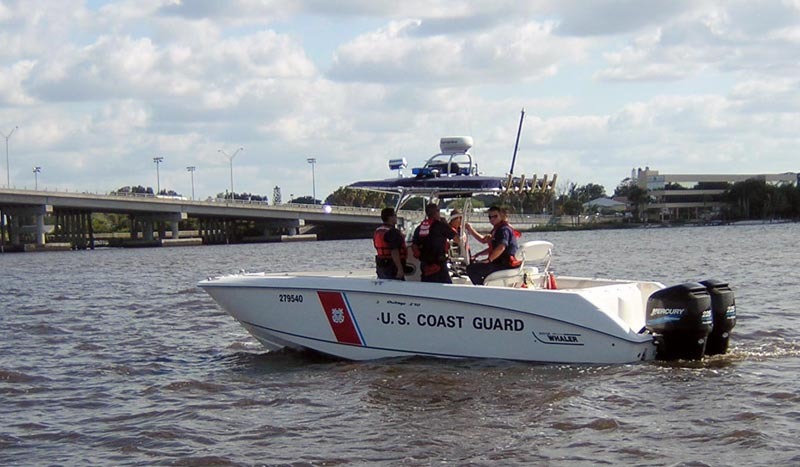 While we were out on a test drive, the Coast Guard came by right on cue in their Boston Whaler 270 Outrage, powered by a pair of Mercury 225-HP engines. Saturday night brought another beautiful evening. After an excellent southern style dinner of chicken and pulled pork with all the fixings, Will Rogers and Teresa Dunagin gave away more prizes and awards. Did I mention the bar was open all weekend? What hosts! 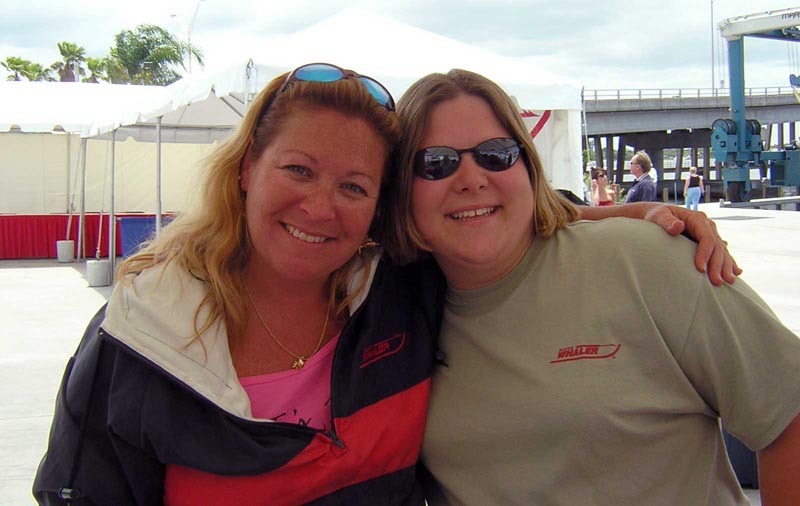 Janis Teagarden (draftmanswife) and Karrin Scott of Boston Whaler say good bye on Sunday after a great weekend. We met for the first time in-person many friends that previously we only knew from the forum or the telephone. 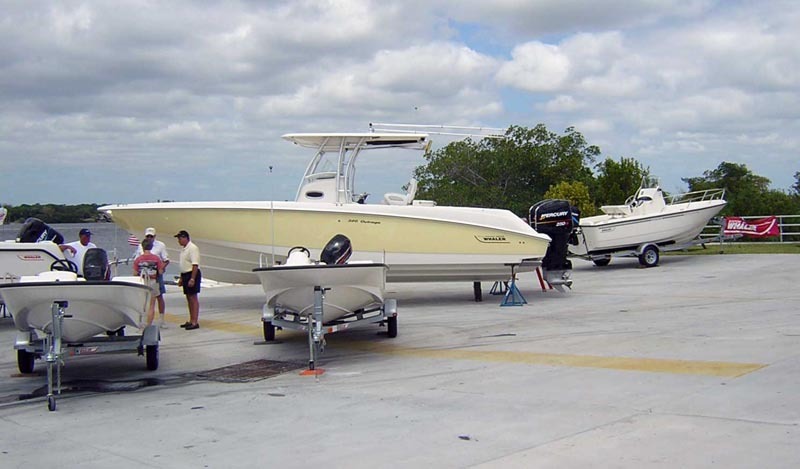 The Boston Whaler people worked very hard on this event and made our visit very enjoyable. Mercury's Robert Moore offered the loan of some of high performance propellers to LHG for some test runs. Here the Marine Max staff has hauled WHALE LURE on a fork lift to allow a quick change. Five sets of counter-rotating stainless steel propellers were tested in a series of all-day runs. Data was collected on the LASER II, MIRAGE, and REVOLUTION-FOUR models of Mercury Marine propellers in two different pitches. The results will be presented in detail in another article (still in the works). 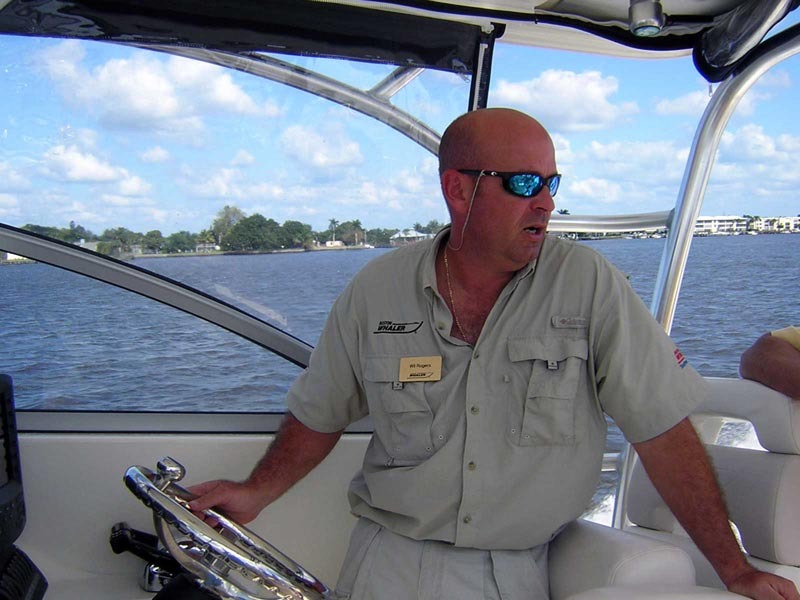 Besides loaning propellers, Robert also passed out tons of literature, had a working SmartCraft demonstrator, and gave away many gallons of Mercury Premium TCW-III oil to registered boat owners at the event. 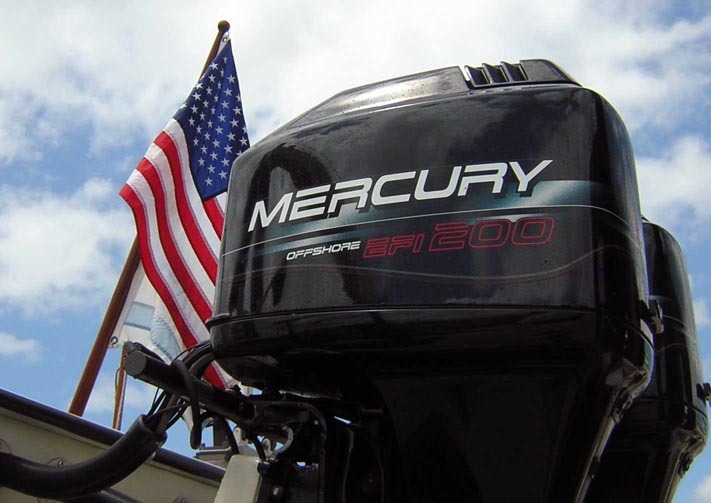 These Mercury engines were made in Wisconsin, where the outboard motor was invented, by unionized workers, in a modern factory, owned by a company whose stock trades publicly on the New York stock exchange and is subject to all the laws and regulations of the United States. After 1600 hours of use all over America, LHG had them inspected recently, mainly as a precaution, and the mechanic reported they were "like new". I looked up at this fine example of American craftsmanship, and I saw the American flag streaming above them. To be standing there, on a beautiful day in South Florida, spending my time with so many wonderful people, I felt very fortunate to be in America. God Bless our nation, its products, and the people who make them! 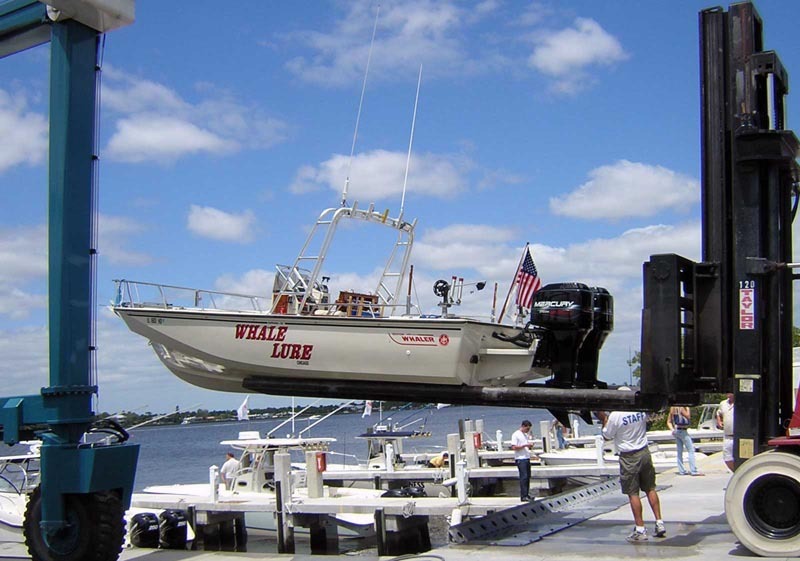 As Sunday afternoon wore on, it was time to load WHALE LURE back on its Continental-brand trailer. With Mercury's Robert Moore at the helm, the big Boston Whaler Outrage easily rolls up the multiple dual keel rollers. Even at low tide, loading was a snap. The Marine Max staff lends a hand at the winch. The guys from Marine Max worked long and hard all weekend to make our visit more enjoyable. If you missed this event, adjust your plans for the next one. 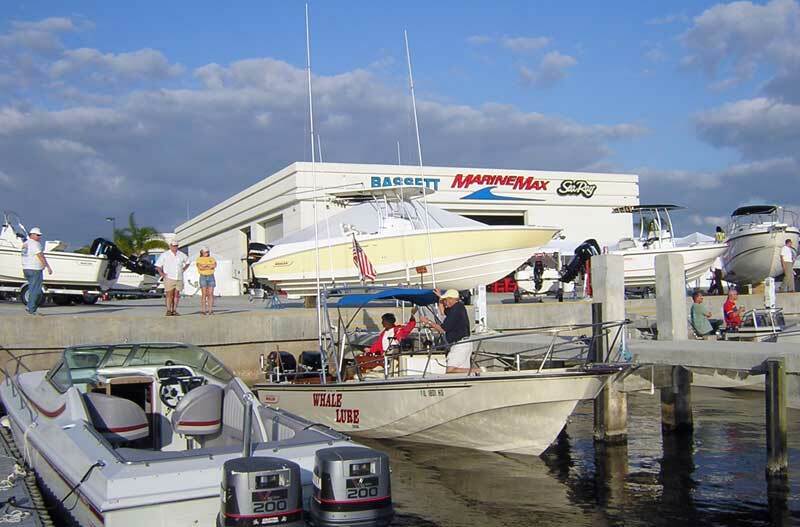 Coming up in May, Boston Whaler will be welcoming owners to a similar gathering in Sarasota, Florida. Check www.whaler.com for details. The page has been accessed 74363 times. This article first appeared April 24, 2004.